On behalf of all staff and administration, welcome to the Gaylord A. Nelson Educational Center website. Here you can find valuable information and resources about Clear Lake School District’s elementary school. It is my privilege to serve as the principal for the students and staff of this newly-remodeled building which houses approximately 350 students from Early Childhood through 6th Grade. As a school community, we are proud of many things, and we work hard to pursue excellence. Our goal is for students, parents, community, and school staff to work together to help all children grow and meet their academic, social, emotional, and physical needs while in the school setting. Working as partners, we can give our children their best educational experience. 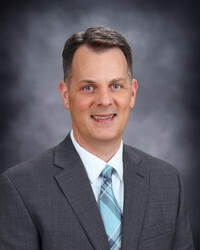 I am in my seventh year as principal at Clear Lake Elementary, and prior to that I was the principal at Clear Lake Jr/Sr High School for six years. My teaching career included four years in Green Bay at Bay Port High School and five years at River Falls High School. During those years I taught History, Geography, and Social Studies, and I was a football coach. I grew up in Clear Lake, so I once walked these halls as a student. I hold many fond memories of my younger years and have great respect for the well-rounded education I was fortunate enough to receive here. My wife, Liane, and I have four wonderful children who attend school in Clear Lake, and we make our home in this friendly community. I am a history, music, and trivia buff, and an avid fan of the Packers, Badgers, and all things Wisconsin. When I have some free time, I enjoy following my children’s activities, travelling, reading, landscaping, and (sometimes) exercising. If you are familiar here, welcome back. If you are new, I look forward to meeting you. Thank you for visiting our website.